For the needs of Macedonian Railways, we have developed the following equipment that are mounted in the wagons and locomotives for more than 15 years. 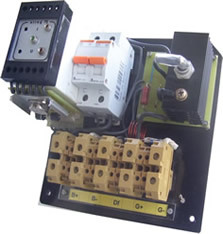 SIREG 75 /16 - L is a voltage and current regulator for a DC generator for a locomotive. The voltage and current regulation is made by an impulse -wide modulation. The regulator is made for output voltages of 24, 48 and 75 V. For the battery protection against overcharging, there is a tyristor over voltage protection mounted in the regulator. It is mounted in the locomotives of the 642, 642/3, 712 and 734 series. REG - A 29/150 is an improved version of the GETZ regulator for an alternator 29,5 V/150A. In the SIETO version the regulator has a possibility for precise setting of the two edges for voltage and current, safer ignition of the tyristor over voltage protection as well as turning on of several types of power transformers for the measuring of the alternator current. SIETO 01- 01 i SIETO 01- 02 are electronic cards for a HS regulator. In the SIETO version they are developed as reserve cards for this type of wagon regulators with a modification in the part for voltage setting and the internal voltage stabiliser. It is possible on the cards to precisely set the voltage of the output voltage and current of the dynamo on a value of 29,5 and 150 A.
EL 30-30 is an electronic deep discharger for batteries, which is used in the battery regeneration process. The discharger is a completely electronic piece of equipment that allows deep emptying of the batteries during their cycling. 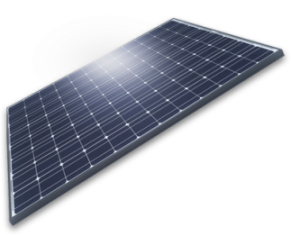 During the discharging the batteries are emptying with a constant current that is set from 0 - 30 A. Since it has a settable under voltage protection, the equipment has a working autonomy and doesn't need supervision during the entire discharging. The discharger is developed as a mono block for discharging batteries with a voltage of 0 - 30 V and current of 0 - 30 A. 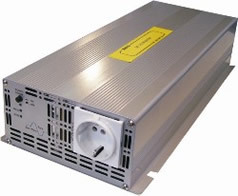 If a need to use greater voltages and currents to discharge the batteries, it is possible that several of these products be connected in parallel or in series. SI-KON 1.5 is a DC/AC inverte which turns the DC 24 V battery voltage into AC 220 V/50Hz . This charges the refridgerator in the car. The inverter accepts variations of the input voltage with range of 19 - 30 V. The Maximall power of the inverter is 1500 W which is enough since the compressor from the fridge pulls electricity with power of 1300 W at every turn-on. The quality electronics and the good design make it safe from quakes and vibrations during the ride. SI-KON 600 DC/AC inverter which turns the 24 V battery voltage in the car into AC 220 V/50 Hz. This voltage is used to power the 220 V electric light in the car. The inverter accepts variations of the input current ranging from 19 - 30 V. The Maximall power of the inverter is 600 W.
SIL - 8 is a piece of equipment used for traffic signalisastion in the railways. The light lanterns are made by high- frequency LED diodes with a total power of 5 W. The light flux of the LED lanterns is 4 times greater then the flux of the conventional lanterns, and the power loss is 2,5 times smaller. They are made in 4 colours: red, yellow, green and white. The lantern's working voltage is 12 V.
SI-REC 20 is an electronic SMPS ( Switch Mode Power Supply ) rectifier. It is used for charging of the equipment in the pay-toll passes. It is designed for input voltage of 145-265 V, and accepts both the frequencies used in the railway traffic - 50 Hz and 83,3 Hz. The correctors are made for input voltages of 12, 18, 21 or 24 V i output of 5-25 A. 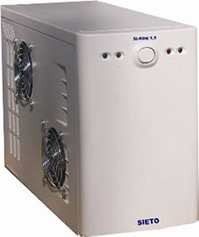 The electronic is placed in an alluminium box which also serves as a cooler . In every rectifier there is a temperature regulated fan for additional forced cooling. EP 12/16 is an electronic ignition for a steam generator for a diesel locomotive which allows warming of the wagons. The electronic ignition completely replaces the existing equipment for forming of high voltage spark. The spark voltage that is formed with this ignition is 30 KV. The small frame and weight as well as the safe spark have proven to be very important components in the exploitation and maintenance of the locomotive. 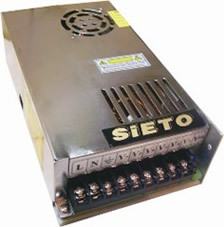 SITERM - 80 is an electronic thermostat for a diesel locomotive. Developed for the needs of the Macedonian railways, it is produced for a temperature range of 70 to 100 C and allows precise control of the temperature of the medium on which is measuring is in progress. SIMIN - REL is an electronic under voltage controller for a wagon car. 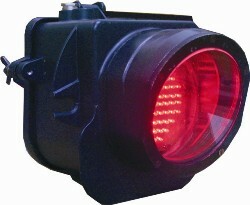 It has been developed as a single piece of equipment for the control of the minimal voltage for the light in the wagon. The setting of the voltage is precise in the range of 16 - 22 V.
SITIM 3 is a time relay for a wagon car that allows the light in the restroom to turn off automatically. The product is placed in the proper case with the button for turning on. The time between the turning off is set on 1 - 5 min.